Fetcher Jenn is a foodie and loves to cook. While we focus on happenings for your professional life here at The Fetch, there’s always an opportunity to link this back to food and what better way than with a recipe to make your lunch breather much more nourishing. Up until now, most autumn veggies were not on my list of edible foods. Brussels sprouts, squash, cauliflower were avoided like the plague. That’s all changed thanks to a few friends who were insistent that I develop a less picky approach to food and I couldn’t be happier. Autumn foods are amazing and it’s giving me a whole new range of options for cooking. 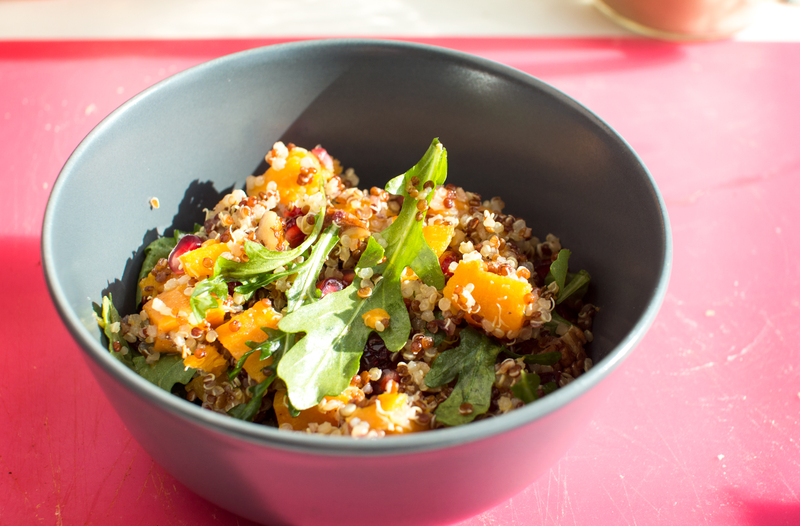 Today’s lunch was an Autumn Quinoa Salad that I pieced together using various things I had around the kitchen. This is so simple: Preheat the oven to 400º. Toss your chopped squash and sweet potato in about a tablespoon or so of olive oil, adding in about a teaspoon each of salt and pepper. I also added in a bit of cumin and cinnamon to make it a bit more interesting. Once everything’s thoroughly coated, spread it out in a cookie sheet lined with parchment paper. Loosely cover in foil – just lay a sheet over it, no need to secure it to the edges or anything. It’s mostly to prevent the veggies from browning too quickly before they cook through the insides. Roast the veggies with foil over them for about 15-20 minutes until they’re soft. Then remove the foil and leave them in for another 5-10 minutes to get a little crispy on the outsides. You want them to be soft, but with a little color. Remove them from the heat and set aside to cool. When it’s done, add it to a large bowl where you’ll assemble your salad. Leave it to cool a bit. While the veggies and quinoa are on auto-pilot, time to chop up your toppings. Just run a rough chop through both the pecans and cranberries. Once everything is warm to the touch, add your cranberries, pecans, and pomegranate to the quinoa. Mix them through for an even distribution. Then add in your roasted veggies and gently mix them through. Adding them separately lets them keep their shape a bit more than the potential mashing they could get when you’re mixing the more solid ingredients. I added in the arugula last so it didn’t wilt. Squeeze some lemon juice over the top and salt and pepper to taste. You’re all done! Go forth and enjoy! About our contributor // Jenn Vargas has worked at Birchbox, Etsy, Flickr and Yahoo, and now leads product at The Fetch. Follow her on Instagram, Twitter or via her new food blog Sunset Kitchen. If I remember to add baking soda to the soaking water, the bean soften faster. I always add a bit of lemon juice or vinegar to the water when I soak quinoa in order to remove the phytates – I don’t know whether that should be done with beans, too.